From A to Z, we have compiled a list of 26 useful personal watercraft tips…can you think of any others???? A: A watercraft anchor is useful when you want to stop and enjoy the marine life or throw out a line. B: Brakes. Sea-Doo offers the only watercraft in the industry with our Intelligent Brake and Reverse (iBR). This technology allows riders to stop up to 100 feet sooner than with any other watercraft. * Our brake and reverse levers allows riders to keep both hands on the handlebars, which give you the maximum amount of control. C: Cover. A watercraft cover provides added security and peace of mind when storing or towing your Sea-Doo. Sea-Doo offers a full line up of versatile, color-matching covers with a strapless design that provides easy installation and a patented air release vent system when trailering. D: D.E.S.S., Sea-Doo’s Digitally Encoded Security System (D.E.S.S) prevents unauthorized use. Each watercraft is embedded with a microchip that is engaged with each lanyard. When starting your Sea-Doo 1 beep means it is ready to start, 2 beeps means readjust the key and push the button again. E: ECO mode. One of the advanced iTC system many power delivery modes, is the award winning Sea-Doo ECO mode that provides up to 46% improved fuel consumption. When a rider activates ECO mode, the engine automatically calibrates the most economical operating speed saving money at the fuel dock and helps riders stay out on the water longer. F: Fire Extinguisher. Sea-Doo personal watercraft are considered Class A inboard motor vessels and must adhere to the same Coast Guard regulations and standards as any other powerboats in this category. You must have a Coast Guard approved marine rated fire extinguisher on board your personal watercraft. G: Gasoline. Sea-Doo watercraft, powered by ROTAX engines, can run on 87 octane, but we recommend 91 octane for supercharged models. H: Hashtag #seadoo if you Tweet, when commenting on your Sea-Doo on Twitter. And follow us while you are at it! I: iControl. BRP’s “iControl” technology is available in every watercraft category in the line making premium technologies available at a value minded price. “iControl” is the umbrella term BRP uses that includes the iBR system (Intelligent Brake and Reverse), iS (intelligent Suspension) system and the iTC (Intelligent Throttle Control) system. J: Direct Drive Jet propulsion. Sea-Doo watercrafts are powered by Direct Drive jet propulsion and deliver more horsepower per dollar, superior handling, increased peace of mind and a better overall experience on the water! K: Kids—make sure you are aware of your local boating ages before allowing your kids to drive the Sea-Doo. L: Learning Key. Sea-Doo’s learning key limits engine speed, allowing first time users and inexperienced riders to develop skills and confidence in a controlled manner. M: Maintenance. To get the most reliable performance, Sea-Doo recommends regular maintenance with your local dealership. N: No wake zones. Always be aware of no wake zones when riding in a new area. Sea-Doo models models with cruise control include a Slow Speed Mode. To activate, when in neutral, hold down the cruise button. Slow Speed Mode is the perfect mode to navigate the No Wake zones. O: Oil. XPS is the recommended oil for all Sea-Doo watercraft. We have a current promotion on XPS 4-Stroke oil. Purchase XPS 4-Stroke Oil and you could win a new Can Am ATV Outlander or a new Sea-Doo GTS 130 watercraft. See your local dealer for details. The contest ends Dec. 31, 2012, so act NOW! P: PFD. A PFD (personal floatation device) must be worn at all times when operating a Sea-Doo watercraft. Sea-Doo offers a full line of PDFs for men, women and children of all ages. Q: Quality. 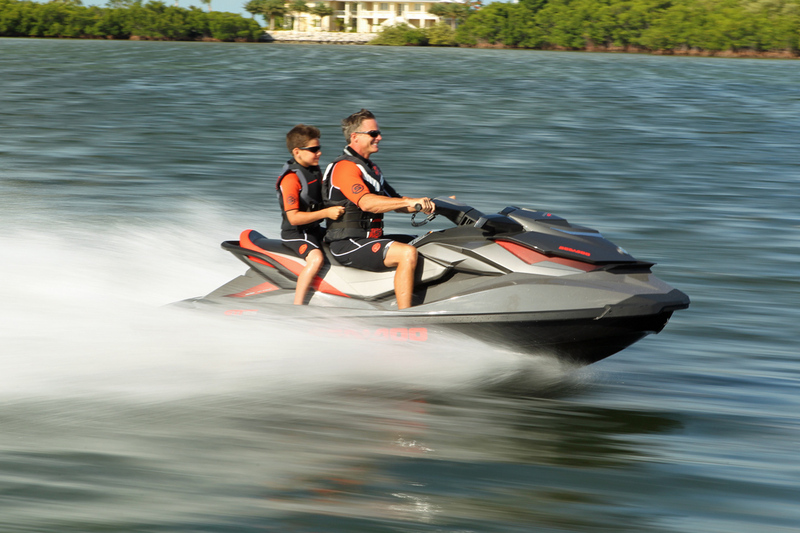 Sea-Doo watercraft and boats provide Quality time on the water with friends and family. R: Retractable Boarding Step. Sea-Doo offers a retractable boarding ladder designed specifically for Sea-Doo watercraft. These boarding steps are spring loaded and designed to stay in the UP position when not in use. These make re-boarding your Sea-Doo watercraft simple and easy. S: Sea-Doo Speed Tie. These speed ties eliminate slimy, wet, tangled dock ropes and unclutters your storage area. T: Retractable Tow Pylon. To help simplify towing tubers, skiers or wake skaters, Sea-Doo offers a tow pylon that is retractable and provides an easy, high-rise pylon that includes built-in spotter grab rails. U: Understand your local boating laws, licensing requirements, signs and waterways. V: Value. Sea-Doo provides excellent value. Sea-Doo watercrafts include standard equipment such as iControl, including iBR and iTC, come standard in every watercraft category. W: Wake! Sea-Doo WAKE models are the watercraft choice of the best wake athletes in the world (such as the Nike 6.0 Wake Skate team) and are the only watercraft specifically designed for tow sports. X: X-Team Tuesday. Meet, learn about and follow the Sea-Doo X-team riders on our blog every Tuesday. Y: YUASA is the Sea-Doo recommended replacement battery, they can be purchased through your local dealer. Z: Zebra Mussels are harmful aquatic hitchhikers and these invasive crustaceans disrupt the traditional aquatic food chains of many inland lakes. These voracious mussels enter into fragile ecosystems and impact the lake’s ecological food cycles. These crustaceans can spread to inland waters by being transported as hitch hikers attached to PWC and boat hulls, engines or other services. Many lakes require watercraft to be thoroughly cleaned and dried before travelling between waterways. Be cautious when operating your Sea-Doo in inland lakes and abide by all posted rules regarding potential transportation of this invasive species. * Based on BRP internal testing. Traveling at 50 mph (80.47km/h). 27 tips from A to Z. The last time I checked there were 26 letters in the alphabet. You are correct! Thanks for the catch of our typo Ray! V: VHF Radio. If you’re taking your watercraft out on the sea, make sure you have a VHF/DSC radio secured to your PFD.